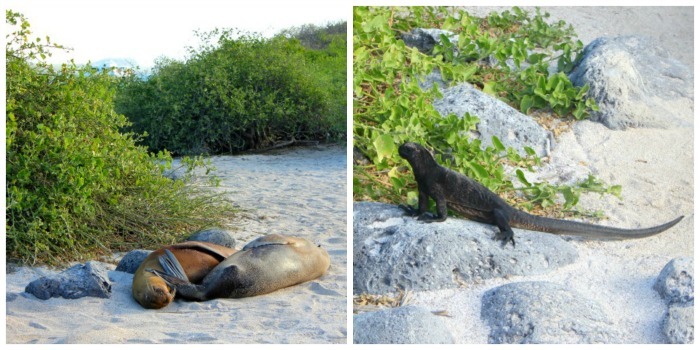 Hiking on the Galapagos Islands I was just as distracted by the wildlife as the landscape. Even on the same island, the areas went from a rocky path surrounded by low trees to a sandy dirt path of low bushes to a large rock beach that lead us back to the sandy areas. When I start hiking I always start off in a rush, trying to get into the rhythm of heading along a path. But on these islands, its not about getting to the final point. Its all about taking the time along the way. My group soon realized that at any point, we would stop and watch. Seeing the birds flying above, discovering the birds sitting on their nests among the bushes, spotting a young sea lion sleeping until its Mum returns with food or coming eye to eye with a lizard. At every turn, there was something to see. I had thought the wildlife shy and reserved, and that I would have an occasional view of a bird or the lucky chance to see a land iguana. But I soon discovered the magic of the Galapagos Islands was the endless opportunity to see the wildlife – from afar and up close. The people were few, the animals many. We had entered their environment and I knew my next days would be filled with unforgettable sights.